Mar-a-Lago members really got the full benefits of their $14,000 annual dues (after a $200,000 initiation fee) this weekend when esteemed President Donald Trump chose to conduct state business at a dinner table in the most public area of his country club. 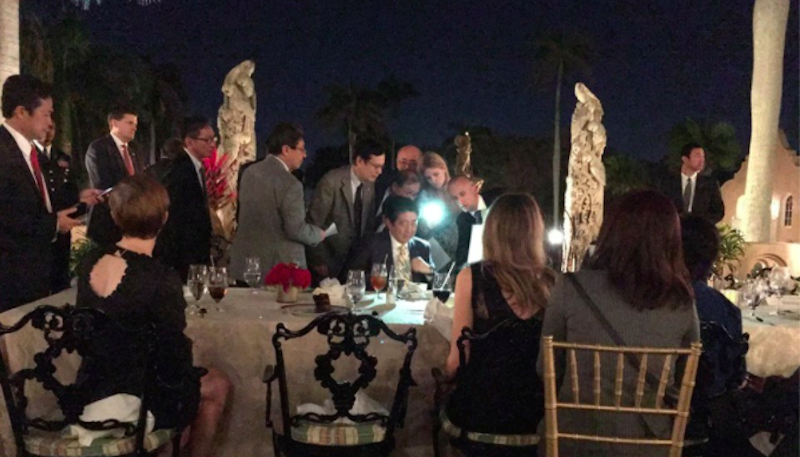 It was a great sacrifice by Trump, who was forced to govern the country by flashlight, possibly because no one would see him doing it if he went inside. All the while, guests whose only qualifications were spending a lot of money on golf watched and listened. “Wow......the center of the action,” one Mar-a-Lago member, real estate investor Richard DeAgazio, wrote on Facebook this weekend alongside series of photographs he took of the president of the United States conducting official business. Phones — especially phones with their flashes turned on for improved visibility — are portable television satellite trucks and, if compromised, can be used to get a great deal of information about what’s happening nearby, unless precautions are taken. Eventually Trump and Abe gave a joint statement, where Trump opted not to read his prepared remarks. We know this because he also allowed the prepared remarks he did not deliver to be photographed. Trump left the impromptu briefing room without taking questions, having delivered the first emergency foreign policy statement of his presidency. But even as he confronted one of the gravest matters of his office, Trump nonetheless found it impossible to resist dropping in on a nearby wedding reception, already underway in his treasured Grand Ballroom. Trump designed and built the space himself after purchasing Mar-a-Lago in the 1980s. Entering the ornate room, Trump took a photo with the bride and her bridesmaids, who posed in red gowns next to the commander in chief, mimicking his signature thumbs-up. Then he grabbed a microphone. “They’ve been members of this club for a long time,” Trump reportedly said. “They’ve paid me a fortune.” Priorities! !